Bruce Groendyke, a severely nearsighted Army vet from Hightstown, New Jersey, says he’s a “technical dinosaur.” But as one of many veterans who attended a recent class held by New Jersey State Library’s (NJSL) Talking Book and Braille Center (TBBC), he learned how to use the assistive technology features on an iPad. 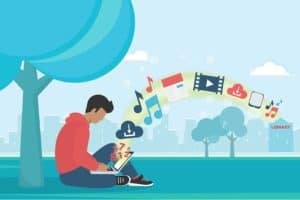 NJSL and other libraries nationwide have been joining forces with state agencies to improve their patrons’ access to assistive technology. 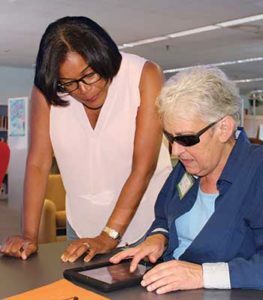 Through a partnership with New Jersey Commission for the Blind and Visually Impaired (CBVI), TBBC has partnered with seven public libraries to provide accessibility programs for patrons with visual impairments. Most of these services are geared toward New Jersey’s aging population. As the US Administration on Aging reports, the population 65 and older is expected to double by 2060. The leading causes of vision impairment in the US are age-related eye diseases, and the prevalence of these diseases is expected to double in the next three decades, according to National Eye Institute data. For example, macular degeneration, which currently affects just over 2 million US residents, is projected to affect more than 5 million by 2050. NJSL’s Library Equal Access Program (LEAP) provides free computer and iPad training classes at assistive technology learning centers in seven locations. Training includes beginner and advanced-level instruction on using reading magnification and speech software to read websites, emails, and other documents, as well as an introduction to the assistive technology features now available on iPads. This program is sponsored by CBVI and targets adults 55 years of age and older. Mary Kearns-Kaplan, adult outreach services coordinator at TBBC, says that what is unique about LEAP is that the New Jersey commission has purchased equipment, such as computers, software, iPads, and closed-circuit television magnifying machines for each library. It has also provided funding for free training. Classes are limited to four participants to maximize individual attention from trainers. LEAP launched in November 2015, and to date has trained more than 100 people. Classes for veterans like Groendyke came about thanks to a grant from Disability Rights New Jersey. 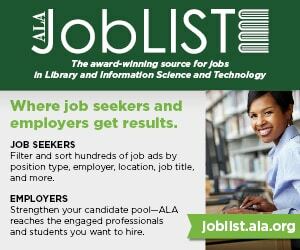 Instruction for both NJSL programs is provided by the nonprofit Advancing Opportunities and includes one-on-one help from an assistive technology specialist. Cleveland Public Library’s (CPL) Ohio Library for the Blind and Physically Disabled (OLBPD) partnered with the State Library of Ohio Talking Book Program, which coordinates programs of the National Library Service for the Blind and Physically Handicapped (NLS). The NLS program provides free recorded and Braille books to eligible adults and children. OLBPD provides approximately 12,800 Ohioans with reading materials produced by NLS or locally. 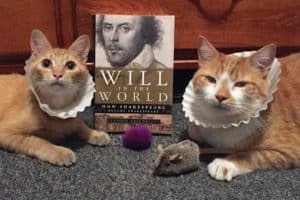 OLBPD receives just under $1.3 million in state funds and $234,000 in federal Library Services and Technology Act funds each year to support the statewide program, according to Missy Lodge, associate state librarian for library development. This funding pays for staffing, facilities, and operating expenses. CPL is also able to provide adaptive workstations at 10 library branches throughout Cleveland from a combination of discretionary funds from the State Library of Ohio, endowment funds, and donations to OLBPD. 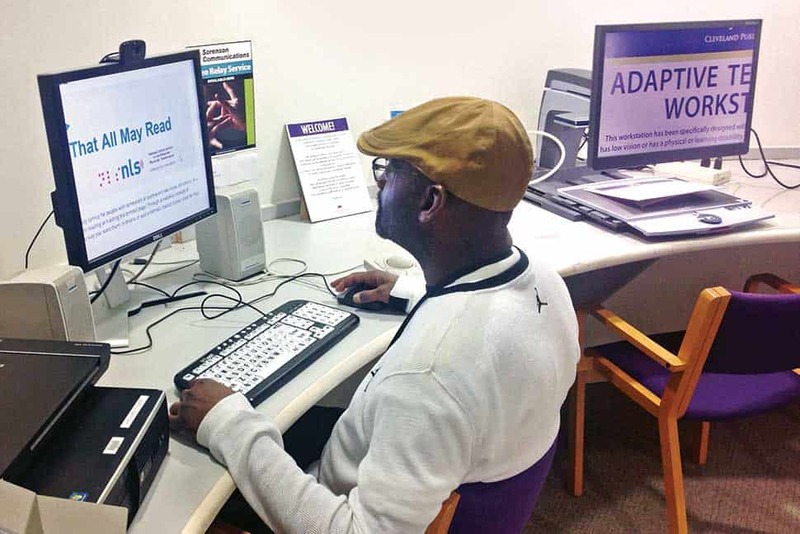 “Whether they have a question on how to use an iPad, a screen reader, OCR [optical character reader] text-to-speech software, we make those all available here at the library,” says Will Reed, regional librarian for OLBPD. New York Public Library’s Andrew Heiskell Braille and Talking Book Library works with city and state agencies to help spread awareness and information about its services. Chief Librarian Jill Rothstein says staffers are always learning about people who are eligible for services but didn’t know they existed. The New York State Commission for the Blind has donated a refreshable Braille display, which is used for individual coaching. The commission will also donate a tactile graphics embosser to make tactile maps or diagrams for education. Heiskell Library teaches a variety of skills, such as how to use VoiceOver software, MAGic screen magnification software, and iPads. Chancey Fleet, assistive technology coordinator, says staffers are surprised at what motivates someone to learn assistive technology or Braille. The library is the regional library of the NLS, which means it provides Braille and talking books through postage-free mail to patrons. 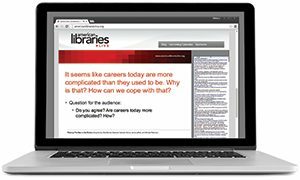 Rothstein says that members of the library’s technology department are native users, meaning they use the assistive technologies themselves and then teach those skills to patrons. She says libraries just need to decide to serve people with disabilities and train staff, and they can get a head start by hiring native assistive technology users who can share their knowledge with patrons. Updated Jan. 3, 2017, to correct Chancey Fleet’s title. Updated Jan. 17, 2017, to restore links.